Maruti Swift, the car that laid the foundation for the compact hatchback segment in India, has raced past the million-unit sales mark in quick time. Maruti Suzuki India sold 108,619 Swifts in April-October 2013, up 18% over last year. 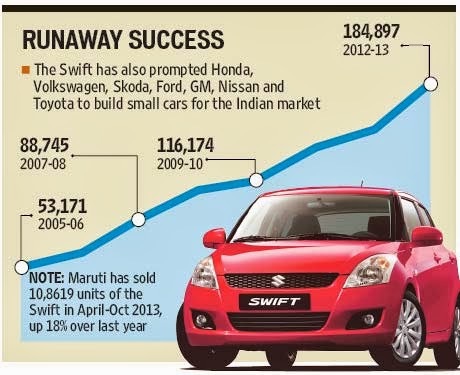 Swift that was launched in the summer of 2005, achieved the milestone in a little over eight years, faster than cheaper and smaller cars like Maruti 800, Alto, Omni, Wagon R, Hyundai Santro and Tata Indica. It also lost three months production due to two separate instances of labour strife at Maruti’s Manesar factory. Although, Alto remains the largest-selling car in India, Swift has closed the gap every year. “The sales of the Swift have exceeded our expectations. In 2005, we targeted sales of 5,000 units a month and some people thought we were dreaming as nobody would buy such an expensive small car in India,” said Mayank Pareek, chief operating officer marketing and sales, Maruti Suzuki India Ltd.
“Today, it is the second-largest selling car in the country with close to 200,000 units sold annually. In, fact till last year, it commanded a waiting period as demand outstripped supply.” The success of the Swift indicates India’s growing preference for small cars that are relatively expensive but offer more space, power and features. It has also led many other global car makers like Honda, Volkswagen, Skoda, Ford, General Motors, Nissan and Toyota to build small cars in the Indian market. “It is natural for the market to graduate to cars that offer more space, power and features,” said Remy Pothet, global automotive practice head, TNS Automotive. What will be the Impact of Increase in Annual fuel bill of Sedan owner after Petrol price rises to Rs 67 ? Duster modified by LZParts - call it as "ADMIRABLE"